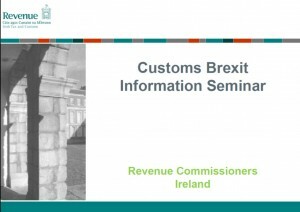 Revenue has been running a series of seminars across the country which are focused on helping companies to prepare for Brexit through having a better understanding of the Customs processes and procedures. The latest seminar was last week in Wexford and they have now also advised the date for a final seminar in Sligo. If you are interested in attending, details can be found on Revenue.